The New Zealand Plant Conservation Network (NZPCN) provides information about native plants and their conservation, focusing primarily on nationally threatened plants and plant communities that require conservation management for their continued survival. 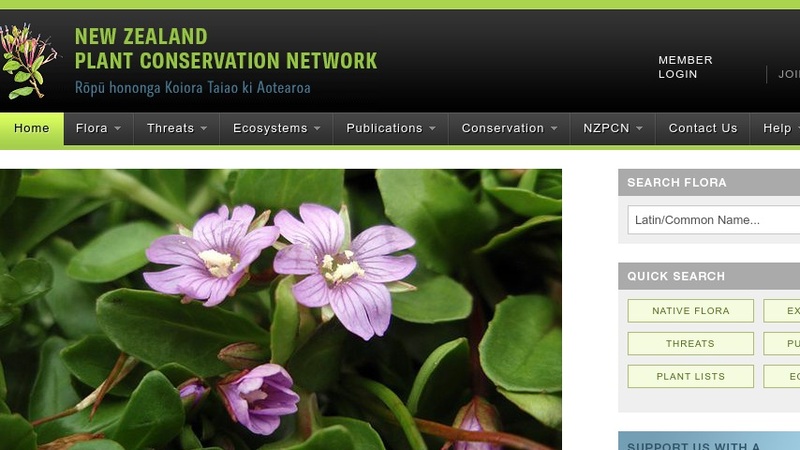 The NZPCN web site features a database and search tool for locating information on nationally threatened plant species and lists of species that are regionally uncommon. Users may search for threatened plants, bryophytes, fungi, naturalized (introduced) plants, or animal pests by common name, taxonomic name, conservation status, or family. The information includes taxonomic nomenclature, common name, geographic distribution and habitat, a description, images, conservation status, cultural use or importance, and other data. Other materials at the site include information on New Zealand native plants and threats to native plant life, an archive and bibliography of publications, event announcements and news articles, and information on the organization's membership.